The remains of an Ammonite on 'Traeth Mawr' , near 'Cwm Nash' . This fragment is about 25cm wide. Location - on the wave cut platform , near the 2nd large slab of rock to the north of the path/stream down to the beach. Twenty kilometres of spectacular Blue Lias Limestone cliffs are between Ogmore-by-Sea and Llantwit Major , punctuated by sandy bays and coves . 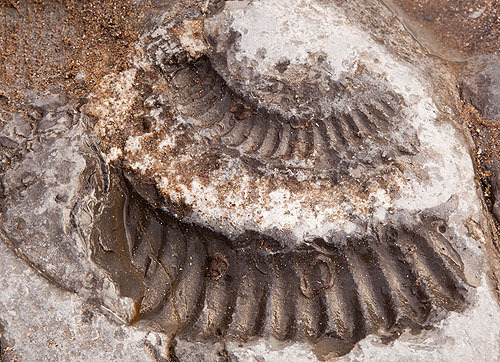 The Blue Lias is famous for its fossils, especially ammonites .